I had always wanted to make banana bread with my browning bananas but I thought it would be a long process. The other day I was finally like I’m just going to do it. I looked up a recipe and found out the banana bread secret: it’s so easy!! This recipe is sooo delicious because the bread turns out gooey on the inside and crisp on the outside. Mmm Mmm Mmm!! 1. Mash the bananas and then add the melted butter. 2. Mix in the sugar, egg, and vanilla. 3. Add baking soda and salt and mix. 4. Add the flour last, bake at 350 degrees in a preheated oven for one hour! 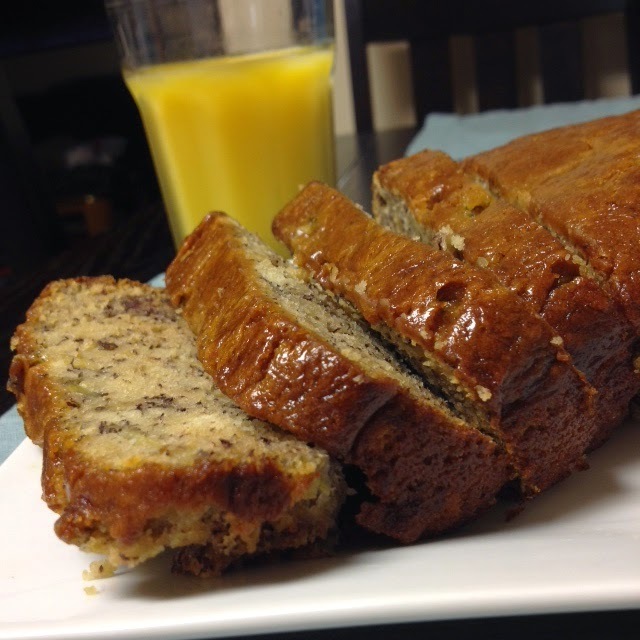 Thanks for sharing your banana bread at the Wonderful Wednesday Blog Hop. Always great to see you! Like you – I've been wanting to make banana bread for a long time. That looks and sounds delicious. I have an old family recipe that's almost identical, but in place of the butter, it uses sour cream. I don't always have sour cream, but I always have butter. Thanks for posting this recipe. Now, I won't have to run to the store for sour cream every time I want to whip up banana bread. Oh that sounds delicious!! I'll have to try that! my dream banana bread 🙂 nom nom nom!! That looks and sound so good. I need to stop throwing out over ripe bananas. Love Banana bread and this recipe sounds awesome! Thanks for stopping by the Boost Your FB Post hop! I love banana bread! I have never made it because I thought it would be complicated also, but I am going to try your recipe the next time we have browning bananas. I haven't had banana bread in so long. This looks absolutely exceptional and so easy! I'm going to be debating with myself to bake this or not! Thanks for an excellent link to the letter E.
going to bake this tonight! my tip is to reduce the sugar a little and add broken up dark chocolate! usually glass will need less time. Let us know how it turned out! That is so good to hear! Thank you! I made this with a mini loaf pans and they turned out great! Making this luscious banana bread right now! It is baking and I cannot wait for an hour to be up so I can taste this wonderful recipe. I also added a half a cup of chopped walnuts! Thank you so much for this recipe.